STEP 1 – Position belt on your pizza oven as shown below. Note direction of travel. STEP 2 - If your belt is too long, it might be necessary to cut any excess belting with wire cutters. Before doing this, hold the belt together as if it were connected and check the tension of the conveyor belt to decide how many wires need to be removed. The belt should lift between 3-4" when pulled upwards. If necessary, carefully cut the wire strand(s) to remove the full width strand wire. The wire strand weaves between two rows, so be sure you are only cutting out the intended wire. 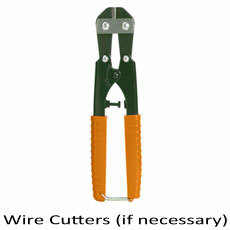 If wire cutters are not available, you can weave this wire in and out to remove the wire strand and shorten the belt. STEP 3 - Once you have established a desired length, connect the provided inside master links/splice clips. When examining all splice clips, you will notice that 2 have a longer left and right side. 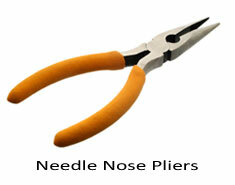 You will use these for the edges after the center splice clip is in place. Check that the splice clips are oriented as shown below and bend them with your needle nose pliers. STEP 4 - After all splice clips/links are connected, check for freedom of movement of the conveyor belt by pulling it forward (as it will move in operation) for about 2-3 feet (60 to 90 cm) with your fingers. The conveyor must move freely. These instructions will assist you with installing your pizza oven belt purchased from pizzaparts.com using the supplied strand wire. STEP 1 – Position belt on your pizza oven as shown in figure 1 and refer to the belt as Section “A” and Section “B” (Note direction of travel). 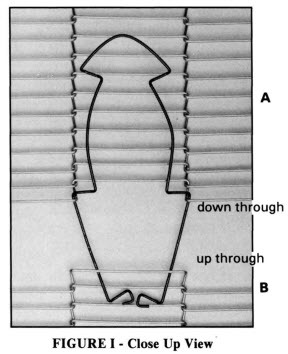 STEP 2 – Carefully bend the center span of the splice wire, as shown in figure 1, trying not to distort the “Z” bends. Insert the splice wire down through the top of section “A” and up through the bottom of section “B”. STEP 4 – Locate the next “open” Z bend in section “B” and weave down through at location B1. Weave up through the next “open” Z bend in section “A” at location A1. STEP 5 – Continue step 4 until you have reached the edge of the belt. 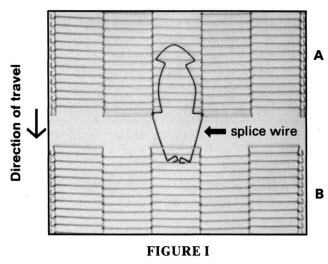 Using needle nose pliers, bend the edge of your splice wire down through the edge in section “A”, and up through section “B”. NOTE – It is best to start weaving from the center of the belt and work towards one edge. Once completed, weave the other side of the belt. STEP 6 – Repeat steps 4 and 5 to complete the other side of the belt. STEP 7 – Straighten the splice strand as much as possible. NOTE – For temporary splicing, splice clips are available for all belts. When purchasing a belt from pizzaparts.com you receive splice clips and a full width strand wire with your order.